Lady Gaga is a renowned singer who is known for not just her music but also for her eccentric attire and fashion sense. You can literally expect anything from this women. From a dress featuring raw meat, to a frog outfit, she’s done it all. She’ll come up with something new every single time. She was letting people know with her reindeer dress that Christmas is just around the corner, reminding her fans about the holidays that are about to come. At the amfAR gala in 2010, Lady Gaga dressed in all white from head to toe. She even wore white makeup all over her body. Fashion doesn't get more bizarre when it comes to Miss Gaga. 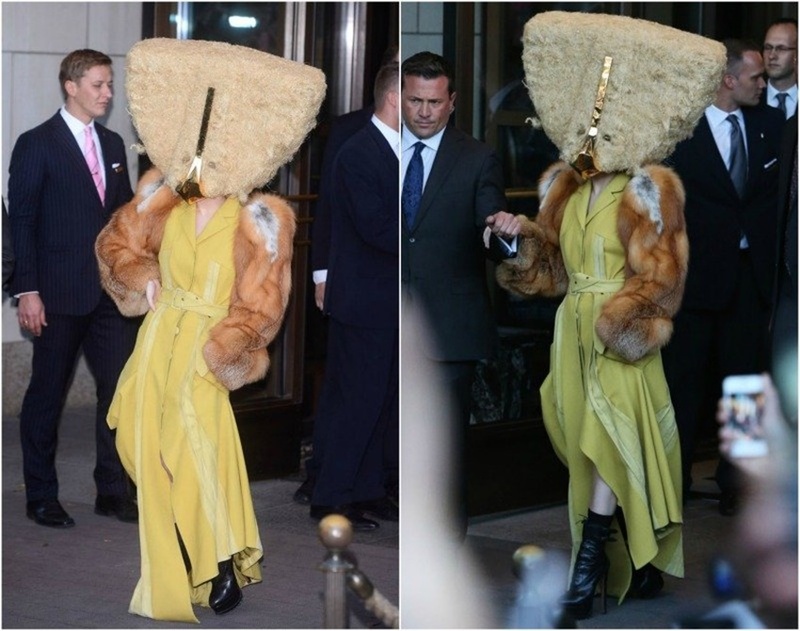 She was seen wearing a dress with a giant head made of fur at the Ritz Carlton, Berlin. 4 Just a normal shiny and grey outfit! She tried her best to shine bright like a diamond with this outfit while attending a meet and greet event. We all feel sorry for Leonardo Da Vinci after looking at this dress. Lady Gaga did another display of her boldness by wearing a dress with the famous Mona Lisa painting printed upon it. Can you imagine someone wearing a dress made of purple hair? Well, you don't have to put a lot of effort into your mind because Lady Gaga has done it. 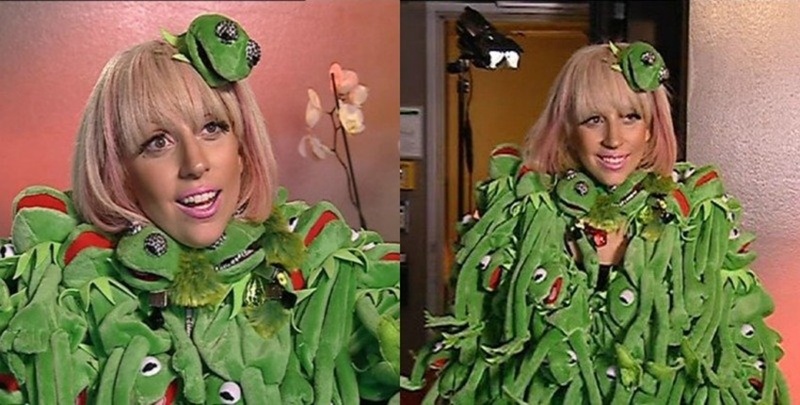 She displayed her frog jacket on a tv show and many people are still confused about her choice of clothing. I guess she's a sesame street fan too. She often makes sure her name's written in the stars. This dress was also one desperate attempt to let the world know how big a star she is. Lady Gaga walked out of her hotel room in a dress completely made of white fur. It was not even that cold! Lady Gaga's entry at the MTV Music Awards was more special than ever when she was seen wearing a dress that portrayed herself as a piece of meat. 11 Another one of her wacky dress! Lady Gaga looks to be playing a Fortnite character with this dressing and makeup. But how did she know in the past?! She made her entrance at the Grammy awards with a bang, quite literally. She was dressed as a thunderbolt, all shiny and sparkling. Lady Gaga seems to be in the costume dress competition mode all the time. Here, you can see her walking the red carpet with a face cage on. There is one question that comes to all our minds when we see most of Lady Gaga's dresses that come with masks, how can she see from in there?! From looking like a star herself to portraying the Sun Goddess, Miss Gaga has all the dresses in her wardrobe. Here's another one of her famous masked appearance. She walked on stage and collected her award with a red lace mask on her face. The dress was not as weird as some of us might have expected, however, she lived up to all our expectations with her emo hairstyle this time around. I wonder how much powder would have gone to waste as the singing sensation prepared for this appearance. Lady Gaga while performing at an awards function, dressed up in her shiny attire. The most significant part of her dress this time around were the artificial wings. She walked the red carpet with a dress made up of purple wires. Her hair also complimented the dress by contrast. Lady Gaga took Madona's vision to a whole new level with this appearance. Her dress's neckline was made of real feathers. 23 Only Lady Gaga can o this....! Lady Gaga looking like Michael Jackson at a Halloween contest. There are no boundaries to her experimentation.